I was a bit disappointed and, yes, a lot jealous, when our school wasn’t chosen to try out the Google Expeditions VR program as it traveled to different cities around the U.S. I had tried Expeditions at some technology conferences and thought our students would enjoy the unique experience. With virtual reality, students wear “Google Cardboard” goggles, which have phones inserted in the front. Once an Expedition is begun by the teacher, the students are basically immersed in the environment as the teacher leads them through a field trip of a place like a coral reef. The VR experience is great, but most elementary classrooms do not have the equipment to make it a reality. Since only one student can use a pair of goggles at a time, and the goggles require a phone, the logistics are a bit tricky for the standard K-5 classroom. On the day of the beta test, all of the teachers who had signed up at our school attended a 30 minute training with the Google representative to learn how to use the equipment. (Google provides everything for the sessions that day, including routers so they don’t have to use the school wi-fi.) During each 30 minute session, groups of 3 students use Android phones that are on sticks (see the pics below) to scan QR codes that are on papers on the ground. The teacher, who has already chosen from a list of possible Expeditions, leads the students through different images, controlling it all on his/her device. All students see the same image at the same time. When the first image appears, there are usually squeals of delight as the students realize that they are viewing a 3 dimensional version of a bee, or a dinosaur, or a volcano. They can walk around all sides of the image, and even, for some, go inside. A few students had some difficulty understanding the spatial dimensions, but most quickly caught on. The enthusiasm of the teachers (many who had never used augmented reality) and the students mounted throughout the 30 minutes as they investigated planets, tornadoes, and some human anatomy. Throughout the day, students in K-4 had a chance to try out the technology, and all seemed engaged. Overall, this technology seems like it has potential for wide-spread use in elementary, since it will be available on tablets (iOS and Google Play) for free. The trick will be to make sure that teachers design pedagogically sound lessons to utilize it rather than depend on the novelty to lead learning. As augmented reality become more ubiquitous, the oohs and ahs will quickly subside if there is no other substance to the lesson. As someone who has been using AR in my classroom for years, I am well aware that it is more important to include technology when it supports the lesson than to depend on the technology to be the lesson. I don’t want to overwhelm you with all of my take-aways from TCEA 2018 so far, so I thought I would give you a few new tools I’ve learned about with brief summaries and links to the presentations. I am really cherry-picking from the plethora of resources I took notes on, so definitely click on any of the presentation links if you want to learn more. If you didn’t see my post about Pear Deck, you can click here. This is an incredible new Add-On for Google Slides that can be used to easily get feedback from your audience in real-time. Great for staff-development and in the classroom. Charlotte Dolat from Alamo Heights ISD (and Area 20 TCEA Director) did a fun session building on the popularity of Insta-pots with her “Instant Tech” site full of F.E.W. apps (Frequently Executed Well). The TextingStory Chat Story Maker is going to be downloaded to my classroom iPads as soon as I return to school. I also want to have my students try out Emaze for a new way to present. I’ve used StoryCorps before, but the team from Richardson ISD gave me an idea to use with my 5th grade GT students as we read The Giver. Ask them when is war justified, and then show them this powerful video on “The Nature of War” from StoryCorps. Tie that in to a Newsela article on the Civil War, and you will have students making powerful connections. I have a few more things to share in the near future, but I don’t want to be a “dumper” as Jennifer Gonzalez would say. If you are still at TCEA tomorrow (Friday), I would love for you to join me at my session at 9:15 am in Room 12B. We will be talking about making global connections, and I could use a few extra audience members to drown out the heckling I will have to listen to from my colleague, Angelique Lackey. Also, I will be using Pear Deck so you can see it in action! My 3rd grade gifted students decided to study volcanoes for their Genius Hour project this year. (Since I only have 3 of them, they do a project together.) When I was getting ready to print out some Planet Earth sheets for my 1st graders from QuiverVision, I noticed that there were also some volcano ones. These are both part of the free Education Starter Pack, which you can find here. My students love these augmented reality sheets because they can make their own coloring into 3d images. The QuiverVision app also allows you to take video and pictures. The 3rd graders figured out that they could make the volcano erupt by repeatedly pressing one of the buttons, so they recorded some video of it in action. While we searched for an online diagram that would help them to realistically color their volcanoes and identify the sections, I ran across another way to create a 3d model that will show the interior and exterior portions of a cone volcano. Mt. Fuji is one of the free PaperCraft projects available from Canon. You can download the file, print it on cardstock, and follow the instructions to make your own mini Fuji. There are some other interesting science papercrafts on there as well. My students haven’t tried the volcano one, yet, but are eager to attempt in next week’s class. My next idea is to possibly incorporate the QuiverVision video into the DoInk Green Screen app so we can put the students in there narrating what is happening as the volcano erupts. Talk about being on the scene! One of my students recently professed his fascination with the Periodic Table, and it seems like hundreds of Periodic Table links have suddenly shown up on my social media sites. I decided to curate a list for him, and it seems only fair to share it with you. First of all, Richard Byrne recently shared this post on his site that amazingly has 6 other Periodic Table resources I hadn’t collected, including a link to a Periodic Table game. Remember Kramer’s coffee table book that could actually be used as a coffee table? Well, your students may not get that reference, but they will surely enjoy making a Periodic Table table. Click here to see a photo by Jamie Gallagher that uses country flags on the Periodic Table to identify where each element was discovered. I would love to know how long it took to make this Periodic Table of Pumpkins. This interactive Periodic Table is perfect for my 4th grader, so he can click on an element and immediately see a short summary of the element’s main uses. I’m quite impressed by these elemental haikus. They are mysterious enough to make me want to learn more about each element to interpret the haikus! Kaycie Dunlap has personified the elements by designing each one as a cartoon character. You can purchase her flash cards on her Etsy store, or challenge your students to make some of their own after seeing her examples. If you want to throw in some augmented reality, don’t forget about the super-cool Elements 4d Cubes that you can make on your own! About 4 years ago, I had one of those crazy-ideas-that-sounds-good-because-you-haven’t-really-thought-through-all-of-the-obstacles. In a nutshell, I invited the parents of my students (I teach a GT pull-out program, K-5) to send in videos of themselves telling their children how much they matter to them. I used Aurasma Studio to create augmented reality experiences so that whenever the students scanned their parents’ pictures in their folders, they would see and hear the video of encouragement and love. The project turned out to be much harder than I expected, but the results were good. The students were surprised and excited, and I learned a lot more about them and their families through the videos that I received. However, by the end of the year the novelty was gone and I suspected most of the printed parent pictures needed to trigger the videos got thrown away with all of the other school supplies that were zealously surrendered in order to make room for summer fun. In my mind, the “You Matter” Augmented Reality Project was something I was grateful I had done but would probably never choose to do again. Flash forward to last school year. One of my 5th grade students lost his mother in a tragic accident that stunned the whole community. In the usual way that we try to comfort people who have suffered such a loss, I attended the rosary and told my student that I would be “there for you.” I felt more useless than I ever have in my teaching career. But then I remembered that this young man was in my class years ago when I did the “You Matter” project. I went home and searched my Aurasma account for his mother’s video. It had been one of my “obstacles” at one point because she was late with the video and then wasn’t sure how to send it to me. But it eventually arrived. And, years later, it was still stored in my account. I downloaded the video to a USB drive. A few weeks later, I called the student to my room, and explained to him what was in the envelope I was giving him. I told him that he may not be ready to watch it now, but that it would be there for him when he needed to remember how much his mother loved him. He took the envelope from me, smiled through his tears, and walked away. He may never watch the video. He may lose the USB drive or delay watching it until USB drives are obsolete (but that’s okay, because I have several different backups now!) . But instead of voicing hollow platitudes I was able to genuinely express how much he mattered to me by making a small effort to remind him how much he mattered to his mother. Never expect that people “just know” they matter. What you say to them and how you treat them are equally important. Educators (and parents) often don’t see the positive effects of our actions. We should never regret the efforts we put into something that seemingly did not have the results we expected – as long as we know we were trying to do what is best for kids. Time developing relationships is never wasted time. The Merge Cube is the latest product to market augmented reality experiences for kids. It is being sold at Walmart for $14.97 – although it looks like it is already out of stock. Beore purchasing it, you should know that you will need a smartphone or tablet to download the apps for the cube. Merge Goggles can also be used, but are not required as long as you have an app-enabled device. If you have Google Cardboard, you can use it with the Merge Cube. However, the Merge Goggles have a special cut-out specifically designed for use with the cube that helps to make the experience more immersive. I have not used this product yet, so I can’t give you a full review (you can see one here by “Dad Does”). It looks like it has educational as well as entertainment applications. According to the website, there is a “Mr. Body” experience and “Galactic Explorer”. The Merge Cube is being marketed as “the hologram you can hold in your hand.” It reminds me of Daqri’s Elements 4D Cubes, but it is actually one cube designed for multiple apps – and developers are being invited to submit more. Merge has several products out there, including its Merge Goggles. You can visit the Merge Miniverse site to see games and YouTube 360 videos that are compatible. I like the idea of the flexibility (since VR glasses require phones and all I have are tablets in my classroom), and will be curious to see what other educational uses come out of this relatively affordable product. Like many ed-tech options, the novelty may attract your students, but it is up to educators to determine if it is a tool that will deepen learning. For other Augmented Reality Resources for Education, check out this page. Joe Tedesco, the man behind SA Makerspaces for Education, posted about CoSpaces a couple of weeks ago. CoSpaces is available on the web, and as a free iOS or Android app. My students and are still investigating its features, so I may be incorrect about what we’ve discovered so far. Using CoSpaces on a computer (desktop or laptop), you can register for a free account and then create projects. To experiment, I created one account that my students could also use (if you do this, make sure each student knows how to start a new project or collaborate with someone else on one). 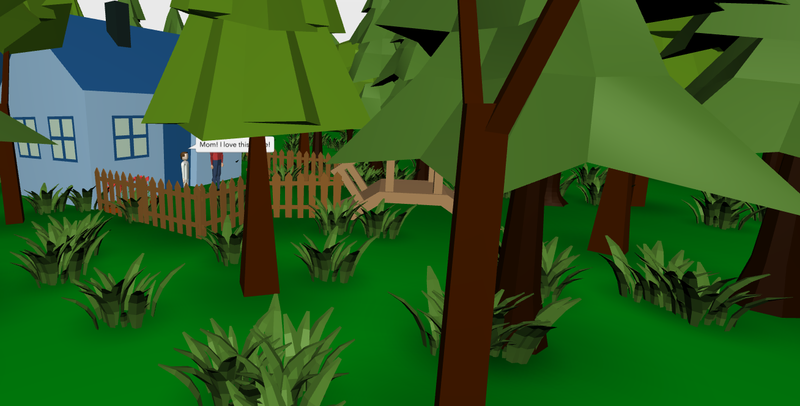 There are tools on the web browser version to “build” 3-dimensional scenes, somewhat Minecraft-ish. For those of us who are spatially challenged, it’s good practice for using other 3-d modeling programs like Tinkercad. You can also add your own images as well as audio files. The scenes can be viewed on mobile devices as 3d by walking around with or moving the device to explore the scenery. If you have a VR headset, you can also experience the scenes this way. The video on this page is the best way to understand how it works. At this time, you can only create CoSpaces projects using a web browser and experience they are best experienced through mobile devices. An intriguing detail about CoSpaces is that it already has a link for educators in its menu – and describes the many ways it can be used in school (such as storytelling or exhibiting research projects). According to the site, there are plans to offer classroom type accounts to teachers. CoSpaces shows a great deal of potential for use by students to create – which is one of the main purposes for technology in my point of view. I have a feeling there are going to be some exciting advances made by this company as it evolves, so you should definitely check it out.